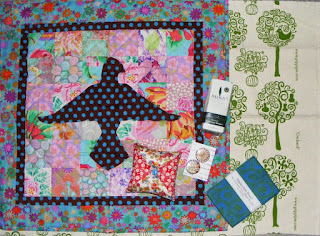 Quilting Adventures: Secret Santa Christmas Swap 2011....! Hello everyone! Merry Christmas! I hope you are enjoying a pleasant holiday celebration. I would like to share with you the rest of my gifts from the SSCS 2011 swap. Here are the rest of the goodies I received from Lurline. Thank you Lurline for the wonderful gifts and thank you Donna from Chookyblue for hosting such a wonderful swap. Wonderful pieces, it is always fun to share with fellow quilters. I am going to start with finishing some pieces and can't wait to start some new ones this year. I hope you and your family have a wonderful New Years. How nice. I hope you enjoy a blessed 2012. I didn't do any swapping this year, I sure miss it. You have some nice gifts. Very Nice Carole -- I love those polkadots! Happy New Year!